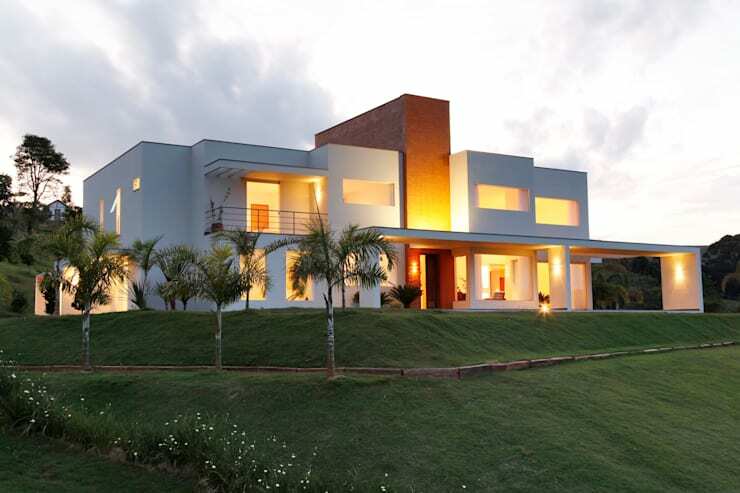 This incredible home, brought to us by Brazil's Carlos Salles Arquitectura sets a new standard in luxurious, modern living, with its cubist construction housing a raft of features designed to pamper and indulge. Perched atop a rolling, green hill, the home impresses with a striking, contemporary form comprised of white and terracotta boxes. Once inside, the magic continues, with its open and light interior framing stylish spaces for living and dining, a kitchen in cool black, expansive bedrooms with an understated allure and even a room dedicated to tranquil relaxation, replete with indoor pool! Moving outside again and we're met with a lovely space for outdoor living, with a dining setting and kitchen both resting in casual style beneath a simple shelter, while a short walk down the dwelling's grassy hill brings us to a stunning swimming pool. The curved shape and glistening ripples of the pool offer an irresistible invitation to dive in for a refreshing dip, while a pool house has been constructed at one end, in order that occupants and guests alike have a comfortable, sheltered place to relax. Perched atop a grassy, green hill, this home exudes modern style and luxury, with its cubist construction glowing amidst its rural surrounds. The home's predominantly white facade appears crisp and clean, with a section of red brick streaming up the centre for a dramatic contrast. Set on a 1600 square metre property, this home is sure to impress, with plenty of understated opulence included throughout. The interior of the home is lofty and light, with its high, white walls and ceilings inviting sunshine to permeate the space with ease. 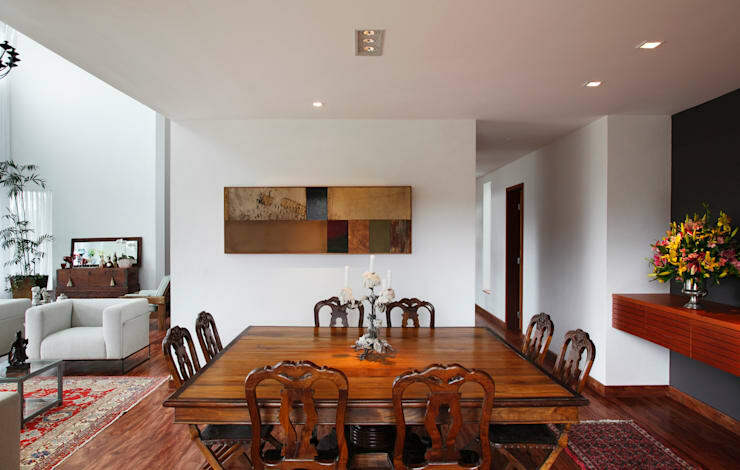 Floors of deep timber balance the white decor, while the rooms are populated by an array of stylish, modern furnishings. The sleek lounge suite pictured here rests simply by a contemporary fireplace, with the green of the home's surrounds and crisp white lines of its exterior flowing in through a generous array of windows. Moving through the abode and we find this lovely space for dining, with a square table and array of ornate chairs exuding classic appeal. A contemporary artwork is displayed for a clever aesthetic contrast, and while a streamlined, wooden bar lines the right hand wall, providing a space for storage and display. The kitchen reveals a streamlined design, defined by black tiles and the caramel tones of timber finishes and furnishings. A lengthy table in contemporary style rests ready to accommodate family dining, while the kitchen in itself presents a dark alcove of gleaming black, with wooden cabinetry providing a contrast of style and texture. Light flows into the space with ease, ensuring that its black finishes don't appear too gloomy, while a lively artwork can be seen mounted in the distance, adding a playful sense of personality to the room. The master bedroom is elegant and sophisticated, with a muted palette of white and grey characterising the decor as flowing woodgrain lines the floor. A large bed rest central, with its quilted bed head and luxurious linens exuding inviting appeal. Bordering the bedroom is an expansive en suite, with the chic, grey vanity and large mirror seen here displaying the beginnings of an understated, contemporary bathroom. As we continue to tour this extraordinary dwelling, we stumble across this exclusive space for bathing and relaxation. 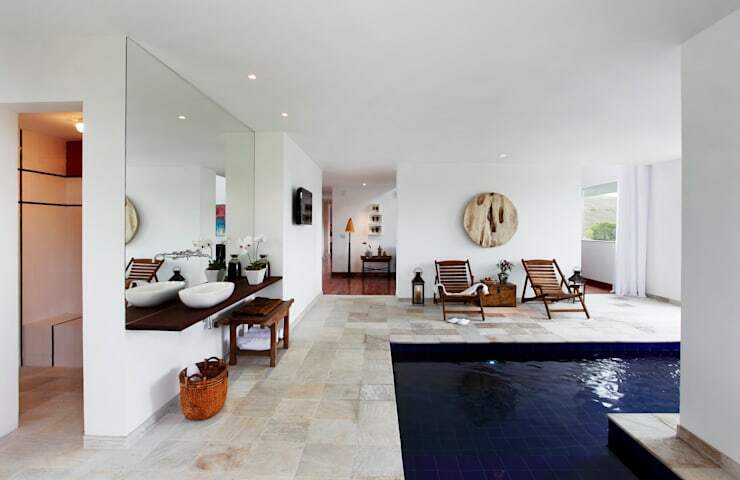 Housing a tranquil, indoor pool set amidst flooring of light stone tiles, the room presents the perfect locale in which to unwind and indulge. 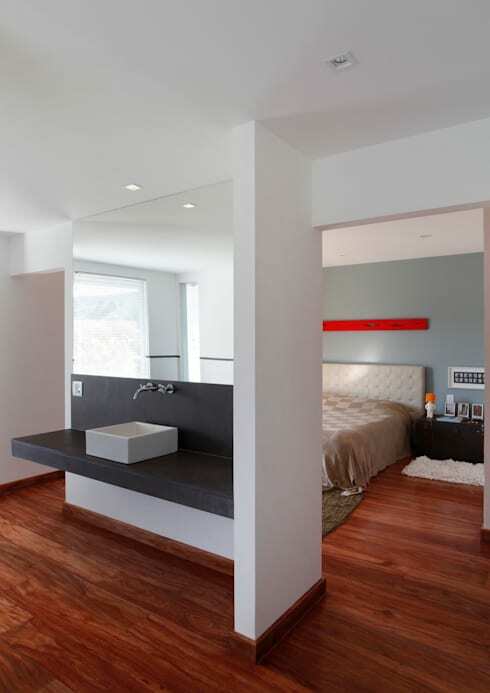 White walls and a large mirror invite light to bounce about the space, refreshing the atmosphere with a calming air. Moving outdoors and we find this lovely, sheltered space for outdoor living, with a kitchen and dining area both included. 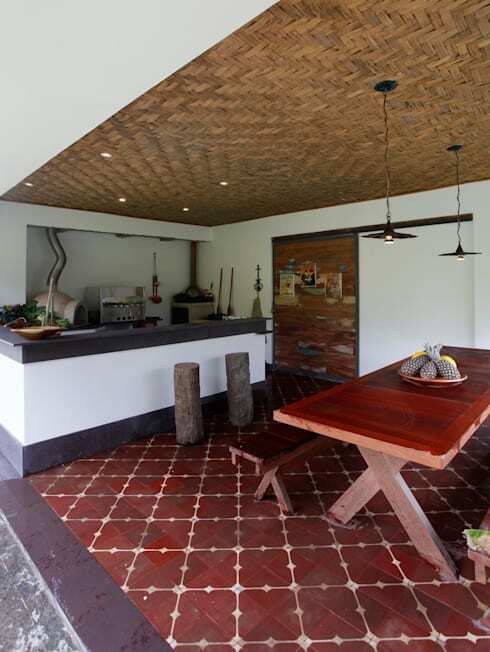 The space exudes a casual air, with its thatched ceiling introducing a new finish to the home's overall decor, while tiles in a deep brown form a stylish pattern underfoot. 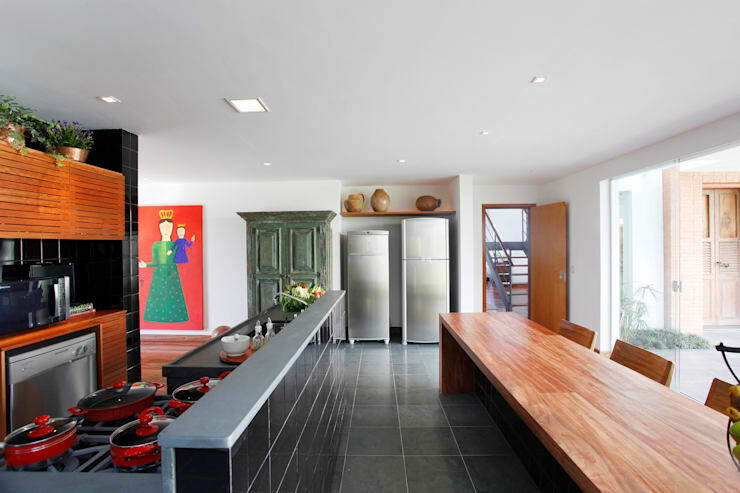 In the kitchen we find a woodfire pizza oven, hinting at the utility of this space in catering a lively soiree. 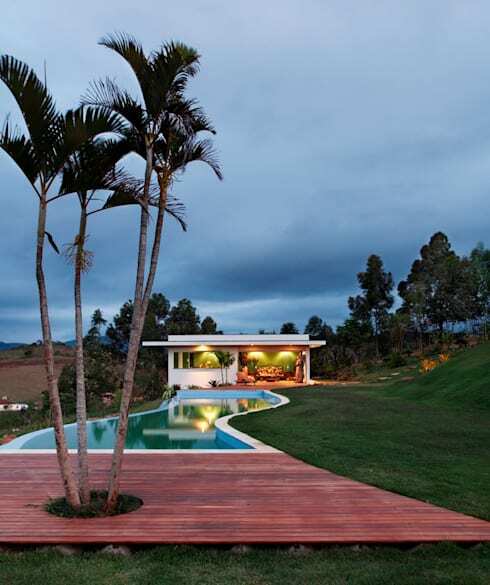 Flanking this gorgeous property is another stunning feature designed to provide optimal indulgence and capitalise on the warm, Brazilian climate. This gorgeous swimming pool snakes its way across the home's lawn, inviting refreshment beneath its gentle ripples. At the far end, a small pool house has been constructed, which is filled with an array of comfortable furnishings for optimal indulgence. Do you like the curved design of this stunning swimming pool? If so, you should take a look at this article on How the house forms and shapes affect our subconscious. Would you like to live in this stunning, spacious mansion? Tell us why below!